At FESPA Global Print Expo Eurolaser showed visitors how to cut printed large areas made of textile, acrylic and plastic materials quickly and efficiently. The Lüneburg-based company demonstrated its L-1200 and M-800 laser systems. These laser systems have efficiency-enhancing additional components such as a conveyor for the automatic and exact material supply from the roll as well as the automatic shuttle table system (STA) for overlapping assembly, processing and unloading. 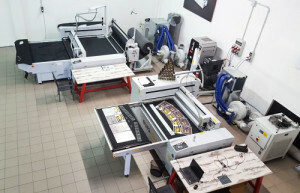 Eurolaser offers processing tables of up to 3.20 meters in width and length as well as additional modules for multicolour direct printing, labelling and engraving for parallel use. The live demonstrations at FESPA of the two laser cutting systems included the processing of textile, Crylux and Forex plates by considering engraving, labelling and optical recognition via fiducial marks. The purpose was to convince visitors of the high result certainty, among others by precise roll feeding via the feeder and the tension-free transport via the especially developed conveyor. Eurolaser’s long-life and high-precision systems can process a variety of non-metals, like plastics, foams, textiles, adhesive foils, woods, acrylics, composites and much more.